← Ball of Red Light Glides Across Sky & Vanishes. Amber Light Changes to Red, Changes Direction & Vanishes. 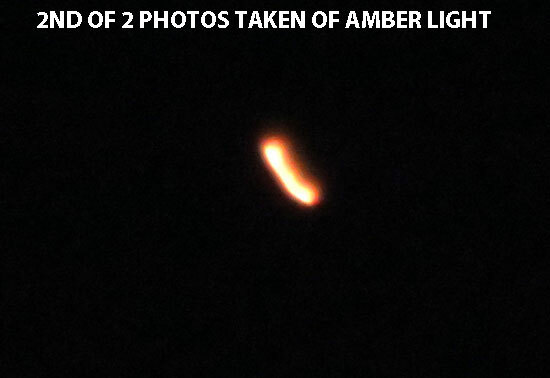 2ND OF 2 PHOTOS TAKEN OF AMBER LIGHT. Description: It was a clear cloudless May 31st night with the wind blowing from the north at about 15 MPH. At about 9:09 PM I was watering my garden in the backyard and looked up and saw an amber light almost directly overhead. The altitude of this thing I would guess would be about a quarter of a mile above me. I observed this light slowly travel from the West to the Northeast for a few seconds and then ran into the garage to grab my Canon Power Shot sx710hs camera which took maybe 10 seconds. As I was running back to the backyard I shot a short video clip, but knowing that it probably would not show up I switched to still image, but forgot that the camera was in macro mode. I took a few shots trying to hold the camera as still as possible. If you have ever tried to take a picture of something in the dark without using the flash then you know that it is almost impossible to get a clear picture due to the slow shutter speed. This object the turned a more reddish color and then went south until I could not see it anymore. I highly doubt this was a lantern due to the fact that it was traveling against the wind and also because of the intensity of the light. This is not the first time I have observed fire orange lights here in Hollister. I along with multiple neighbors have observed these reddish orange lights in the sky several times. These things are always in the same spot of the eastern sky at around 8:30 to 9:30 PM, but this one came from the exact opposite direction instead of the usual east. These things have a consistent repetitive flight pattern. Because of the regular occurrence of these things I have built a mobile wide angle camera system connected to a digital video recorder to try to capture these guys in action. That system is set facing East, but since I set it up there has been nothing until this one coming from the west. I have stopped making reports of these things because of fear of people thinking that I am making this up. I am an experienced astronomer with an 8″ telescope with knowledge of aircraft and such. I take this subject seriously because I had a triangle fly above me a few years ago. I can assure you that these things are not aircraft, drones, Chinese lanterns or helicopters. I doubt anybody has messed with these things more than me. I have hit them with green lasers, 36 million candlepower spotlight and marine flares. There is no way that these things have not noticed me. I sound like a nut right now, but I have a dozen neighbors to back me. This is the first time I have used this site usually I send this kind of thing to Peter Davenport. I will send the pictures I have along with this report. I have a question, is there a way to run the photographs of these things through a spectrum analyzer/spectrometer because I know the F.B.I has a database of just about every light source? I am told that this software has the capability to identify the brand and even the model of a given light source. If this has not been pursued that would tell me that nobody is serious about the whole UFO, UAP or whatever acronym they use. This entry was posted in bright light, glowing red, Orb-like craft, Orb(s) of Light, Photos, UFO Sightings 2017, UFO sightings California and tagged Amber colored, Red colored. Bookmark the permalink.